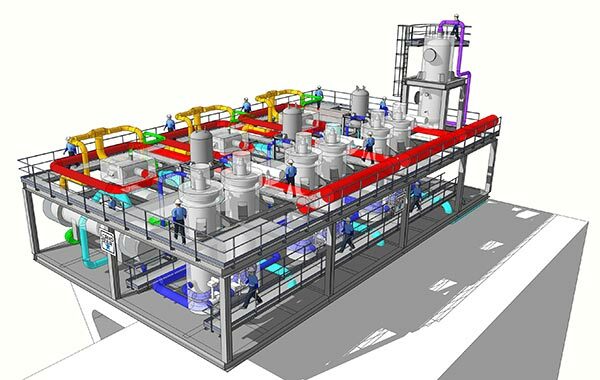 A FSRU (Floating Storage and Regasification Unit) is a flexible, quick and cost-effective method of supplying natural gas for fast track project for short term peak requirements, or as an intermediate solution until the shore-based plant is completed. FSRU’s are typically purpose-built based on the design of a regular LNG carrier, allowing it to still be used as a trading vessel, or alternatively by conversion of an existing vessel. Two versions of StarVap are available – using either glycol water or a propane in an intermediate loop. Modular construction makes expansion easy in 200 mtpa steps, with smaller sizes on request. Recondensers can be included to complete the scope.